Well, there’s no shortage of scooter fun this weekend across America. Amerivespa is already underway in New Orleans, PVSC Band Camp is on near Pittsburgh, The Secret Society’s Scooter Rage 25 (Did he say TWENTY FIVE?) is running in San Francisco, and there’s a NASRA Scootercross race in Indiana. 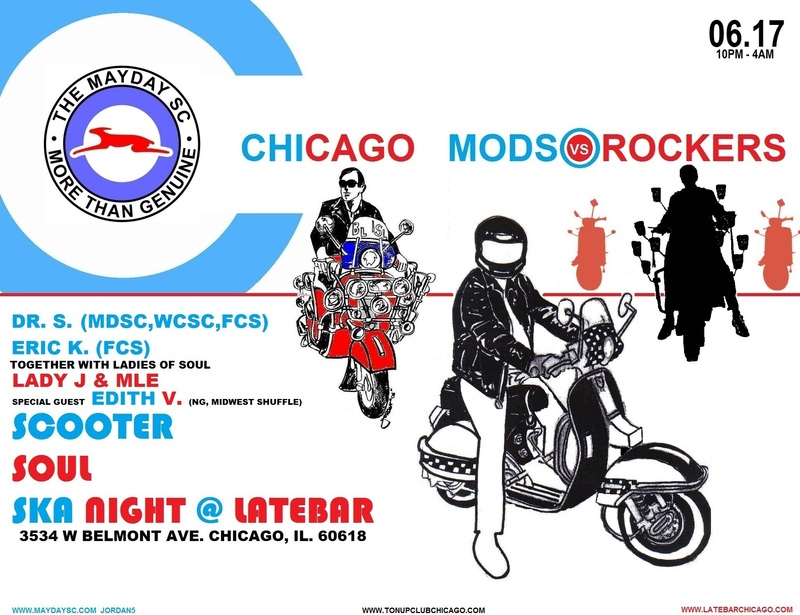 Closer to our home, Chicago’s annual Mods and Rockers event gets bigger and better every year, and don’t miss the Mayday SC allnighter. 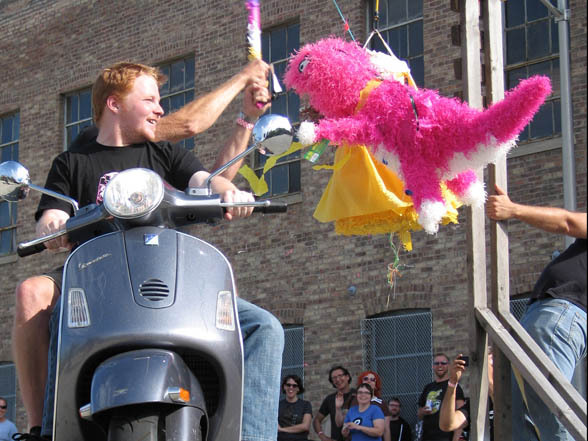 Chicago’s Hell’s Fairies’ Spring Roll(er Derby) is Saturday, too. Have fun, be safe, and if you’re in the Midwest, stay dry! We’ve seen a good number of Halloween rides over the years, but Scooterworks Chicago has taken things a step farther and organized a spooky ride curated and hosted by the experts at Weird Chicago on November 7 2010. The Weird Chicago Scooter Ride leaves at noon from Scooterworks after a 10am brunch at Fireside Restaurant (down the street). Brunch is a steal at $10, and the tour is $15, half-price from Weird Chicago’s usual tours (they won’t have to gas up the bus for this one). The ride runs until 8:30pm and visits “various sites where famous killings and crimes took place in the mob era of old Chicago.” Lots of people dress up for the ride, I love when people wear their silver vampire grillz its a great touch on any costume. What a great weekend, thanks to all new and old friends! If I learned one thing this weekend, it’s to never show up for a DJ gig without the theme from “Jaws.” Video and photos are below! If you’ve been a scooterist in Chicago for the last sixteen years or so, Labor Day weekend is synonymous with Chicago’s Slaughterhouse Rally. 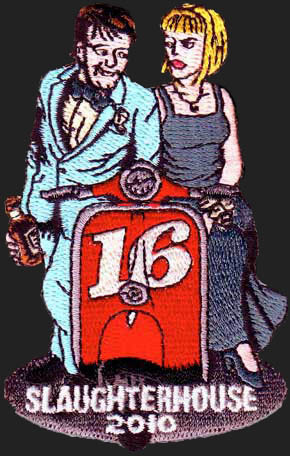 This year promises the “Bittersweet 16 Scooter Prom” and an exclusive Scooterworks sale, along with the usual great riding, drinking and eating. 2SB will be there, and you should too. Starting a couple weeks ago, and into the foreseeable future, Chicago has a weekly Mod allnighter at LateBar called The Merge. It seems to be run by a rotating coalition of mod groups and scooter clubs (and it’s so nice to see teamwork in Chicago lately). You all know how 2SB feels about dressing nice and dancing, so we haven’t been yet, but the next two weeks look promising for folks more into the scooter thing than the preening thing. This Friday (July 2, 2010), there’s a long midnight ride out to Skokie Lagoons leaving at 11:30 from Late Bar. 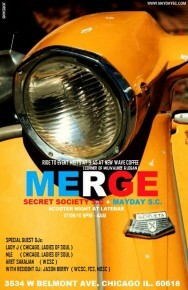 Next Friday (July 9, 2010) the whole shebang’s being run by The Secret Society SC and Mayday SC (flyer above), with another ride and more scooter-related stuff than usual. RIDE TO EVENT AT 9:45 PM START AT NEW WAVE COFFEE (CORNER OF MILWAUKEE AND LOGAN). A reminder to Chicago scooterists: New city tags start today. There’s usually a grace period through mid-July, so if you don’t have ’em yet, move fast. All motorcycles and scooters registered in the city need tags, even if you never park on the street. (They’re commonly called “parking tags” but they’re technically for “road use”). Also, remember that a city tag allows you to park in residential parking zones without a specific zone permit, which is pretty handy (though baseball and special event restrictions still apply, which isn’t always made clear). 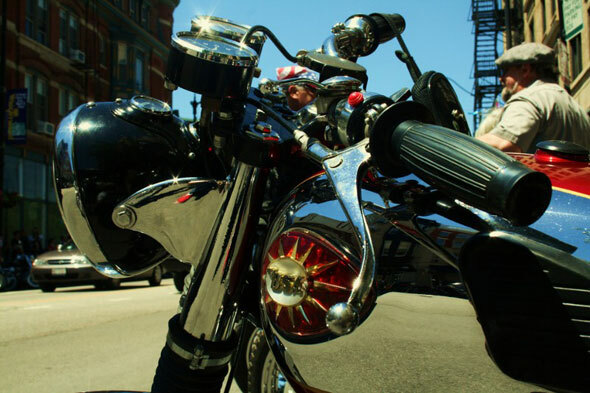 We missed this year’s Chicago Mods vs. Rockers rally because we were at PVSC but Jordan Cinco sent some great photos (below). Looks like an even better scooter showing than usual, but that’s no surprise, it’s always a top event and it gets bigger and better every year. OMG we can’t keep up. Apparently ModChicago is back THIS WEEKEND with Our Way of Thinking: A Simple Headphone Mind and a regular night The Merge at Late Bar (Fridays) starting June 18. I’ll never figure out Mod politics so I probably just pissed off someone there, maybe they’re not related. Facebook is confusing, so I’m not even going to link to it. Karrie will straighten us out. Karrie, please straighten us out. Jordan reminds us Ton Up Chicago’s Mods and Rockers Street Clash is next weekend (Friday June 18-Saturday June 19 2010). This year it looks like they’re moving it from Delilahs to the new(ish) Bottom Lounge on Lake Street. As great as Delilah’s is, it’s been way too crowded in years past I’ve gone (was it at Bottom Lounge last year?) so the new venue (and the less busy street/area) should be a big improvement. Not that an improvement was needed, the event, venue, and artwork have always been top-notch. This year promises an even fuller two days of events, including Quadrophenia at the Music Box, bands (Irving Parkas! ), rides, and the centerpiece bike show. Sadly, I’ll miss it again this year, but Jordan will surely give us a report. Update: We hear the Discovery Channel is shooting the whole thing, so you’ll definitely want to shine up and show off! The Expired Meter posted about Chicago’s new motorcycle-friendly meter receipts, with a closing quote from some negative creep scooterist. All that said, most meters have a very limited parking window anyway, so they’re not an option for commuters or overnight parking. And even though Chicago’s metered spaces seem to be growing exponentially, a Chicago Road Use Tax medallion allows you to park on a wealth of (unmetered) residential side streets without a neighborhood permit. Eventually, those will probably be metered as well, but for now, parking in the city is about as clear and hassle-free as it’s ever been. If you’re not in Cincinnati this weekend, the Magnificent 7 SC is hosting a Chicago-area ride on Saturday (April 10 2010, rain date April 17). Meet at Cafe Cappuccino, 3800 Harlem (next to Bakers Square) at 9:30am Ride departs at 10:30am. Return to city eta 5:00 pm for free pizza and $3 Blue Moon pints at The Playroom on Belmont. This is a long ride; 100+ miles with two planned stops along the way. Please, only larger scooters capable of cruising at 50mph. Johnny at Motoworks let us know there’s another Vespa party at the Adidas Original store (923 N. Rush Street) this Thursday (4-1-10) from 5-9pm. Last year, they had similar parties all over the country, so if your town has an Adidas Original store, you might want to give them a call. They promise “first dibs on new Adidas gear” and a 15% discount at the party. Now, I’ve been wearing Sambas since Pelé played for the Cosmos (Hmm, “Pelé” is in the Mac spellcheck dictionary, nice!). 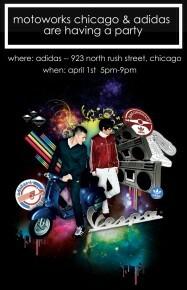 I love Adidas, I love Vespa, but I gotta say, the party last year was a disappointment. I had the impression that the Adidas Originals boutique threw a party at least once a week (Missy Elliot Line! El Salvador Line! etc…) without much thought into pleasing the specific target market. They had a generic trip-hop DJ, and a few chicken salad sandwiches, but (even after being asked a week early) couldn’t wrangle a scooter parking zone for the evening. A respectable dozen or so scooterists showed up, pretty excited about what we’d seen online, only to discover that a tiny fraction of the line was actually available in-store (two shoe styles, a couple t-shirts, and a “meh” tracksuit). No one wanted to stay long, with meter maids hungrily eyeing the assortment of semi-legally-parked scooters outside, and even though the 15% discount was extended to online orders placed through the store, no one bought much. So it may be worth checking out, but I’m betting the Motoworks store opening party will be a lot more fun. The Garrison, fronted by scooter racing legend and all-around good guy Scott Smallwood, plays Friday night at The Rockbox in Chicago, opening for The Bomb, fronted by Jeff Pezzati of Naked Raygun fame.